P1/2 visited Kelvingrove Museum to see Dippy the Dinosaur as part of our Dinosaur topic. We had great fun. We got to handle real fossils and fossilised dinosaur poo!! Our children have researched various jobs and prepared a short speech about a job that they would like to do. Each class was asked to vote for the talk they found most interesting and engaging. 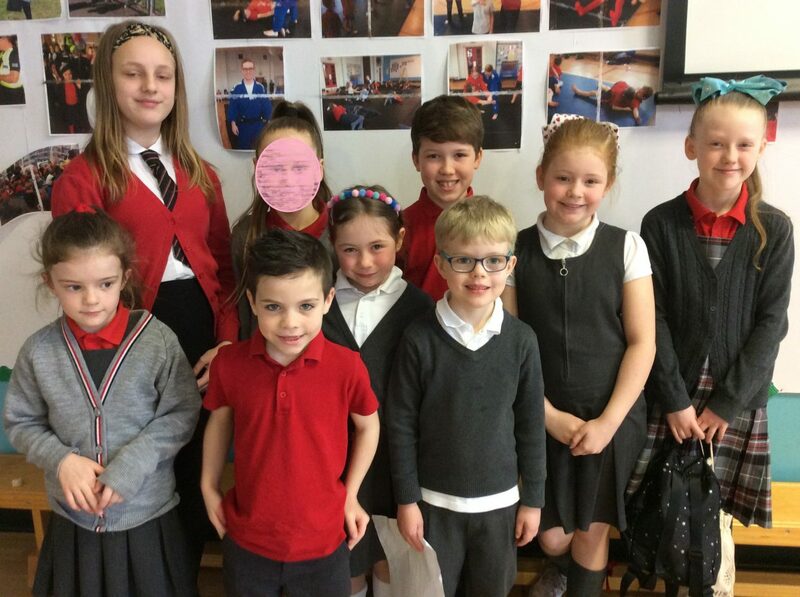 Our class winners presented their talks to the whole school and the overall winner was James Docherty in P6/7, who would like to be a detective. Yesterday, James had the opportunity to be our Head Teacher for the day. I think you’ll agree that he looks very comfortable in that chair! James did a great job and very kindly announced that we could have an extra 5 minutes break! Some of our P7 girls collected money for the Marie Curie Daffodil Appeal and raised £59.26. Our Fairtrade Coffee morning was a great success and we raised £85.10. Thank you again for your baking donations and continued support.